ensure water quality and health. Kettle handle is a rubber material, to avoid overheating, protect your skin. whenever you've craving for a cup of tea or planning for a tea party. It suitable for all types of cooking stoves to bring convenience to your kitchen life. 1) Pull off the lid, fill the water into kettle, then close the lid. 2) Put the tea pot on gas, electric and most induction stove tops. 3) Several minutes later, when it is whistling, it heats up. 4) Move it from the stove. 5) Push the button on the handle for flipping up the spout. 6)Pour out the water on the cup you prepared before. It will heat water quickly for loose tea or tea bags in minutes. Do not put tea kettle or tea pot lid in dishwasher. Hand wash with warm water and gentle soap to clean. Wipe the kettle in one swipe. Just enjoy your life with Homeinart tea kettle! Material：Stainless steel, Capacity: 2.5L or 2.6QT. Easy to maintain: clean design, and mirror polished outside and inside. All surfaces are smooth, which means you can just wipe them in one swipe and it stays like new.The kettle will serve your family for many years. Easy to fill and pour: It is well constructed. The cover of the kettle is snug, but not too tight for quick removal, and the spout projects enough that you could actually faucet fill from there. It is loudly whistle when the water is ready. You can open the cover and it will boil without making noise. Safety design: The rubber sleeve on the thumb latch to open the spout is glued on, so no getting a burnt finger when the metals hot. 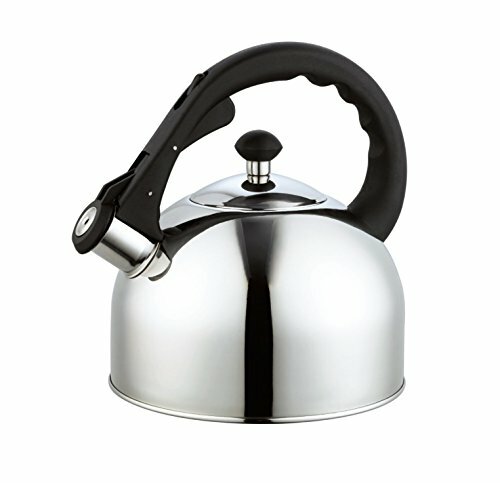 The handle of the kettle is also padded too. Close the top completely, steam doesn't come out the top. All stove top available：Thewhistlekettleworks with gas, electric and most induction stove tops. It is good choice for your daily work picnic and camping. 100% money back guarantee: We are confident you will like our kettles. However, if you don't like this product, we will make you full refund. Limited lifetime warranty. If you have any questions about this product by Homeinart, contact us by completing and submitting the form below. If you are looking for a specif part number, please include it with your message.